Maruti India is presently the leading automobile maker in the country and has been doing incredible business with most of their cars being the best sellers in the car market. This company is a subsidiary of the Japanese automobile giant, Suzuki and India's home bred Maruti Udyog Limited. This highly reputed automotive manufacturer is said to be the biggest producer and distributor of passenger cars across the country and in some of the global car markets as well. The company has many vehicles of different shapes and sizes in their fearsome fleet and have massive production units in Gurgaon and Manesar, both of which are located in Haryana. Their formidable stable has a very practical and spacious 8-seater van called as Maruti Omni, which was first introduced in the market in year, 1984. 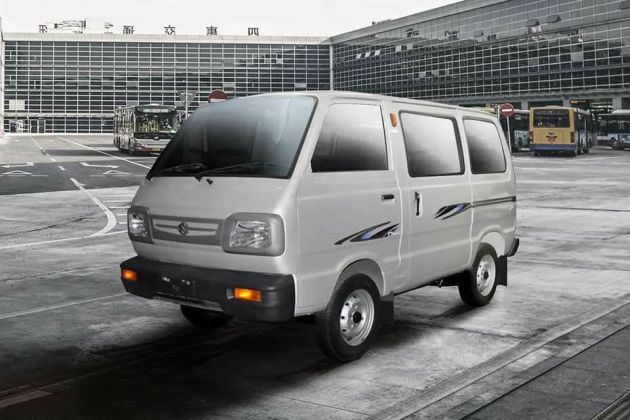 Since then this people mover has been through many changes but has continued to rule the heats of numerours Indian familes as it is very roomy and can accommodate eight passengers with ease along with a moderate boot space, which can take in some luggage as well. One of the variants that is still doing wonderful business in the Indian car market is the Maruti Omni E MPI STD BSIV , which has a balanced combination of sleek exteriors and lavish interiors. The company has equipped this van with a 0.8-litre, in-line petrol engine, which has a 4-stroke cycle and is water cooled. This engine has 3-cylinders that are further equipped with 6-valves and is also equipped with a MPFI (multi point fuel injection) supply system . This peppy petrol mill is skilfully mated with a 4-speed manual transmission gear box and is a front wheel drive. The exteriors of this Maruti Omni E MPI STD BSIV variant have been done up with elegance. The front fascia of this van has an neat front grille with black cladding, which also has the emblem of the company embedded in it. This grille is surrounded with a radiant headlight cluster that have been fitted with high intensity clear lens lamps. The front thermo-plastic bumper has been fitted with bright side turn indicators and the licence plate can be fixed in the center of this bumper. The windscreen is quite large and is made up of laminated glass, which is also equipped with a pair of intermittent wipers. The side profile has a sliding door along with black colored external wing mirrors and door handles as well. The wheel arches have been neatly carved out and have been fitted with a sturdy set of 12 inch steel wheels , which are futher covered with robust radial tyres of size 145 R12 LT 6PR that have a sturdy road grip. The rear end gets a big tail gate with a large wind screen with the regular badging of the name and emblem along with a bright tail lamp cluster as well. The company is offering this Maruti Omni E MPI STD variant in a few vibrant and refreshing exterior paint options. These smooth and lustrous metallic options includes a vivacious Pearl Blue Blaze metallic finish, a subtle yet gracious Silky Silver metallic option, a magnificent and charming Fantasy Black finish and also a sparkling Superior White finish as well. The overall dimensions of this Maruti Omni E MPI STD variant are quite roomy and can accomodate eight passengers with ease. The insides have ample space to give moderate legroom along with good shoulder and head space to all the passengers in it. The overall length of this stylish van is 3370mm along with a total width of 1410mm , which also includes the protruding external rear view mirrors as well. The total height of this van is 1640mm and it also has a roomy wheel base of 1840mm, while it also has a minimum ground clearence of 165mm . This Maruti Omni E MPI STD trim has an approximate kerb weight of 800 Kgs and it also has a fuel tank, which can easily hold up to 36 litres of petrol in it. This stylish and spacious van also has a minimum turning radius of 4.1 meters, which makes it easier for the driver to manuver this vehicle in peak traffic hours as well. The company has done the interiors of this Maruti Omni E MPI STD BSIV van gracefully and have added quite a number of utility based aspects to it. The seating arrangement is very comfortable and it has a reasonable space to take in 8 passengers with ease . The seats are covered with two tone premium upholstery, while the front seats can be reclined and adjusted in accordance to the driver. The front seat head restraints are adjustable and there is a sliding facility as well to the driver's seat. There is an internal rear view mirror, a large glove compartment with lock, front seat belts, floor carpets that add to the elegance of the interiors, a steering lock, front and rear assist grips . Then there is a cup holder and some storage space in the dashboard for utility things to be kept, a three position cabin lamp, multi functional levers and manu more such aspects as well. The company has equipped this Maruti Omni E MPI STD BSIV with a lively 0.8-litre petrol engine. This in-line engine has a 4-stroke cycle and is water cooled. This petrol motor has 3-cylinders that are further equipped with 6-valves and is also equipped with a MPFI (multi point fuel injection) supply system. This petrol mill has the ability to displace 796cc and can also generate 32.8bhp at 5000rpm in combination with a 57Nm at 2500rpm, which is quite good for the Indian roads. This peppy petrol mill is skilfully mated with a 4-speed manual transmission gear box and is a front wheel drive. The company claims that this engine can generate a healthy mileage in the range of 14 to 15 Kmpl , when driven under standard conditions. Maruti Omni E MPI STD BSIV is fitted with a robust suspension system along with a steadfast braking system as well. The front wheels have been equipped with disc brakes , while the rear wheels get a pair of solid drum brakes. On the other hand, the front axle has been fitted with a McPherson strut type of a mechanism, whereas, the rear axle has been equipped with a leaf spring with gas filled shock absorbers. The list of these comfort features integrated in this variant includes well cushioned seats with front adjustable seats, sun visor for the driver as well as the front co-passengers, sliding windows for the rear seat passengers , internal rear view mirror and other such aspects. Then there is a bright instrument cluster with round dial meters , a tachometer, front seat pockets to keep a few smaller things. Then there is a recirculating ball and nut steering wheel, which makes the manuverability of this van simpler. The company has fitted this Maruti Omni E MPI STD trim with some very fundamental and crucial safety aspects. The list comprises of rear door child locks for added protection of the little ones, adjustable seats for better driving experience for all the passengers, adjustable hear rests for added comfort, a highly developed engine immobilizer to protect this van from thefts, brake assist for enhanced braking, a two speed front wind screen wiper, a high mount rear stop lamp, clear lens headlamps along with some more of such vital safety aspects, which ensures proper security and protection of the passengers and the vehicle. Pros: Interiors have moderate space, easy on the pocket. Cons: Mileage should be more, several features can be added.